The scaffolding that obscured the Bank of Spain for a major renovation was removed recently, revealing a newly-clean edifice. The bank’s chief is working to ensure those changes go more than skin deep. Pablo Hernandez de Cos and his team are on a mission to repair the reputation of the central bank, still disparaged for its failure to crack down on a credit binge that culminated in a property crash and 2012 bailout. The economist, who’s proven himself a forthright critic of government policies, is driving more research on “real-world” topics after Spaniards suffered through a devastating economic crisis, and making sure the Bank of Spain is at the table for Europe’s most important conversations about monetary and banking policy. At 48 years old, he’s among the youngest members of the European Central Bank’s Governing Council, and represents a new generation of leaders in Spain pushing to modernize the country’s institutions, including the monarchy, companies and politics. His efforts in the Bank of Spain come at a time that central banks globally are under attack and the value of technocratic “experts” is questioned by politicians. Economists inside and outside the institution say his ambitions will require a major effort. Hernandez de Cos is “trying to bring back rigor and credibility,” said Lorenzo Bernaldo de Quiros, head of political consultancy Freemarket Corporate Intelligence in Madrid. In June 2018, the conservative government promoted Hernandez de Cos to governor from head of the Bank of Spain’s research division. 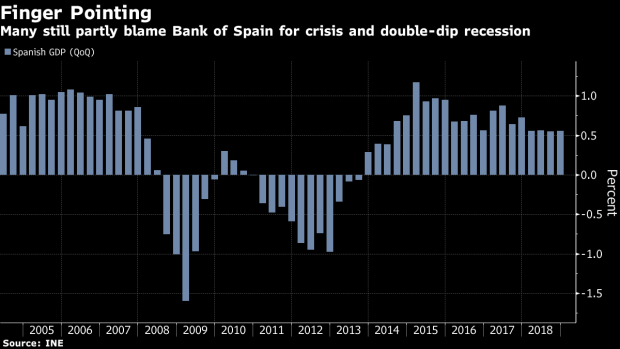 Unlike his two predecessors, he’s a career central bank official, and economists say that’s granted him independence from government officials in Spain. He’s proven outspoken, questioning government policies, budget targets and minimum-wage plans. Building on changes that he and research director Oscar Arce had already begun before getting the top job, Hernandez de Cos has integrated regional and global research for the first time in two decades, ending what some inside the bank referred to as a “Berlin Wall.” There’s also a push to weave in analysis of credit and other financial metrics, key for Spain after its bank-led crisis. He was recently appointed chairman of the Basel Committee on Banking Supervision, which sets global regulatory standards for banks. It’s a shift from his lower-profile predecessor, Luis Maria Linde. The one-time adviser to the ECB’s Executive Board earned an economics doctorate at Madrid’s Complutense University. He joined the Bank of Spain as an analyst in 1997. Researchers at the institution in Madrid still feel his presence. They hold a meeting every six weeks where about 60 Bank of Spain analysts debate current monetary policy, an initiative set up to mimic ECB Governing Council debates. While Linde wasn’t a frequent attendee, the current governor nearly always shows up and challenges the economists. He then expounds that analysis at ECB meetings, ensuring Spain has a voice on the major policy issues. It may have been tongue-in-check, but Hernandez de Cos knows there’s a serious message underlying it. To contribute to the “public debate on the economy, the Bank of Spain must also reinforce its transparency and modernize its communication,” he said.